My special guest on this week’s My 80s radio show, choosing his Favourite Five 80’s tracks is Jamie Days. As a young boy in the Eighties, Jamie started to keep a diary, and has already published his daily musings from 1984. He has contributed excerpts from his diaries to The 80s Annual, vol.II, due out this November. I asked Jamie a few questions about his diaries and growing up in my favourite decade. What made you start to keep a diary at the tender age of eleven? My nana bought me a tiny Grange Hill diary for Christmas in 1983. I’d had a little Paddington one before, in 1982 or 1983 I think, but I never stuck to it. But something in 1984 made me keep going. How many years did you write your diaries for and how difficult was it to keep them going for that long? I kept a diary from 1984 to 1986 and then for a couple months in 1987, then started again towards the end of 1989 up until the end of 1994. It was hard to keep them going and I didn’t always write every day, sometimes I’d write a few days at a time or catch up on the week at the weekend. How did you feel when you first began to read the diaries in adulthood? I’d always re-read them on and off, particularly those from ’84-‘86. For example in 1992, for some reason, I started to type them out, but it was only recently I re-visited the late ‘80s early ‘90s ones. It’s these later ones that really make me cringe. The detail I went into and how I went on and on about what friends said and did and how I felt about everything…*groan! * In terms of the ones from the 80’s they really make me laugh. It’s almost like they’re not by me; just this innocent boy entering into, but at odds with, this adult world. They’re also quite a good reminder of what is important to teenagers, and where their heads are, which can help bring some perspective when dealing with my own kids. Why did you decide to publish your diaries? A number of reasons really. Mainly, it is that I had a friend who kept diaries in the 80s and she planned to publish hers. I was helping her work out how she might go about this and started to share my diaries with her. I’d always thought they wouldn’t be interesting to anyone else, but she loved them. Sadly, she died before she got chance to realise her ambition. However, as we were working through it, we discovered other people who were blogging or tweeting their old diaries and I just loved them! They were hilarious and moving and I wished I could have the whole lot to read. So after I’d typed out all of 1984, I thought why not? I’ve always had ambitions to be a writer but never seem to get round to finishing anything. But I have written diaries, which are a form of book, so why not?! How did it feel when you first let someone else read your diaries? Was it scary making the entries public? I guess it felt quite daring, to assume anyone else would be interested. Diaries are by their very nature self-indulgent and individualistic, so why would they appeal to anyone else? In terms of revealing myself, it was all so long ago it doesn’t bother me. That said, letting the people I was at school with, who are in the diaries, read them has been weird – and I haven’t let my Mum and Dad read them all!! Whilst I’ve fessed up to quite a lot of what I got up to, that they had no idea about at the time, they’re not ready (or I’m not ready) for the whole truth!! You’ve had some fantastic feedback from people who have read the diaries. How does that make you feel? It’s brilliant and really touching in many ways. I recognise they won’t be for everyone. A lot of people get more pleasure from the now and the future, rather than looking back, but for those who tell me they’ve had them laughing ‘til they had tears in their eyes, that’s just amazing. Some of your entries are hilariously candid. Do you think a lot of readers, especially the guys, can relate to the situations you found yourself in? Potentially yes. I’ve talked to a couple of guys who’ve read them and, particularly in reference to those more candid elements, they’ve said things to me like you think at the time it’s just happening to you, but reading my experiences makes you realise it’s the same for everyone. Also, that a lot of what I wrote about is normal, yet it doesn’t get talked about, so it’s refreshing to have it out there. But more broadly, I think we all have teachers we don’t like, friends we fall out with, music we fall in love with and struggles with our changing bodies and environments! Are you still mad about Madonna? Did you keep any memorabilia? Not really. I still have huge affection for her because she was a massive part of my growing up, and her songs bring back great memories. She also broadened my horizons into art and cultures I don’t think I would have found without her (I’m still convinced that I managed to scrape a B in my General Studies A Level due to my essay on censorship and freedom of speech, which centred heavily on the banning of the Like A Prayer video and the content of a Channel 4 season called Banned!). However the musical genres she explores on her records these days aren’t ones that appeal to me as much. I still buy the albums but find there are only a handful of great songs on them. I had masses of memorabilia, but as her career progressed there was too much to collect, so I narrowed my collection to UK only releases and magazines with her on the cover. I had over 2000 at one point but eventually sold virtually everything on eBay. I managed to pay for a loft conversion out of it though! I still have some bits, the more sentimental items, but nothing like I used to. You mention Smash Hits magazine throughout your diaries. Have you kept any copies from the Eighties? Well, as you’ll get to find out in the diaries, I ended up cutting up all the original copies I bought for my Madonna scrapbooks. Then I would buy them again from charity shops, jumble sales and off friends, cut them up for swaps etc. But now, thanks to the internet, I’ve acquired every issue from the very first one, up to the early 2000s. They’re great to look back on. It was truly an iconic publication! Judy Blume and Sue Townsend were your favourite authors as a boy. Whose books do you enjoy reading now? Without a doubt my favourite writer is David Sedaris. He’s recently published extracts from his diaries, and I love them. I also really love Andrew Kaufman, JD Salinger and Alan Bennett. I spend two hours a day on a train commuting so I read a lot. I love books about life and people, so I am fond of memoir, autobiography and fiction that is character driven. You’ve published your 1984 diary, with 1985 coming out in October. Are there any more diaries to follow? Yes, I’m definitely going to publish 1986, hopefully next year. It’s probably my favourite, and I may well publish the others from 1989-1993. However I was 16 – 20, so the content is very different!! 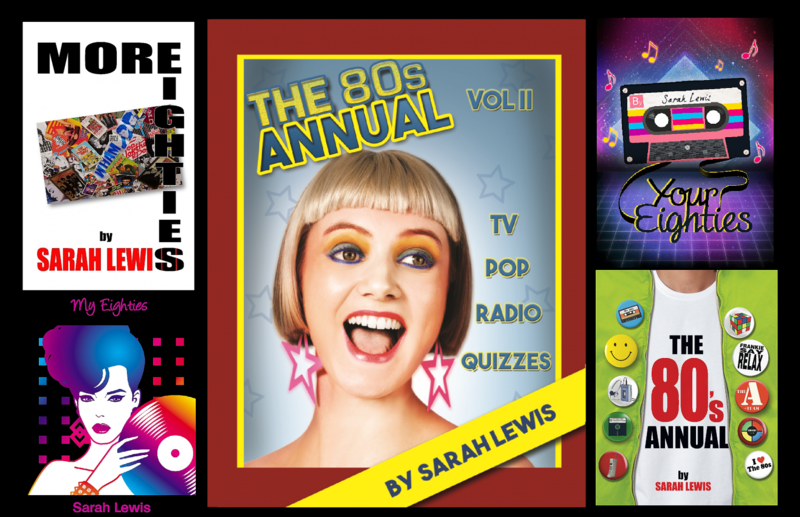 What is your favourite year of the Eighties and why? 1985, without a doubt. It was a real coming of age year for me. I started to get into music properly and the music was great. Arguably, the music in 1984 is better, but from a nostalgia perspective I remember a lot more of the music in ’85. I started getting Smash Hits, started writing down the charts, started listening to Radio One properly and religiously. And, of course, there was Madonna! How amazing was she that year?! If you could return to 1984 and give your 11-year-old self any advice, what would it be? I’d tell him not to worry about stuff because it all works out brilliantly in the end. I’d also tell him to buy multiple copies of every magazine with Madonna on the cover, all her limited editions and special releases and to keep them in immaculate condition as they’ll be worth a fortune!! Jamie Days 1984 Diary is available on Amazon. I’m Buzzing Off To Mad Wasp Radio! Reblogged this on Jamie Days Diaries.